Are you hungry? 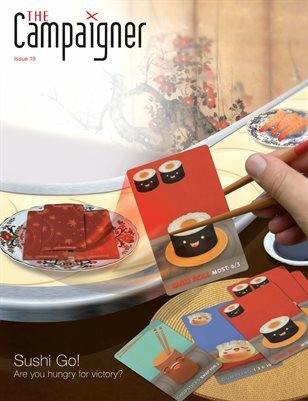 This issue we feature Phil Walker-Harding’s hit game Sushi Go!, and talk to him about where the idea came from and how it went from crowdfunding to be published by Gamewright. The game design legend Bruno Cathala takes some time out to talk about his career and game design methodology. A collection of hobbyists talk about how, and why, they customised some of their favourite tabletop games. Jamey Stegmaier answers questions on Stonemaier Games decision to leave Kickstarter and pre-orders. All this plus Worlds of Roleplay, news and much more.